Land of Golden Sunshine — The Sun Man visits Lisa in a dream. This article appeared first on Heart to Heart with Asha. When you’ve been giving these Sunday service talks as long as I have, you’re bound to have your favorite topics, as well as those you’d just as soon avoid. I’m guessing the story of Adam and Eve is at the bottom of almost every speaker’s list, because it truly is a can of worms – it’s philosophically complex, spiritually subtle, and it touches on areas that one doesn’t always know how to work into a sermon. 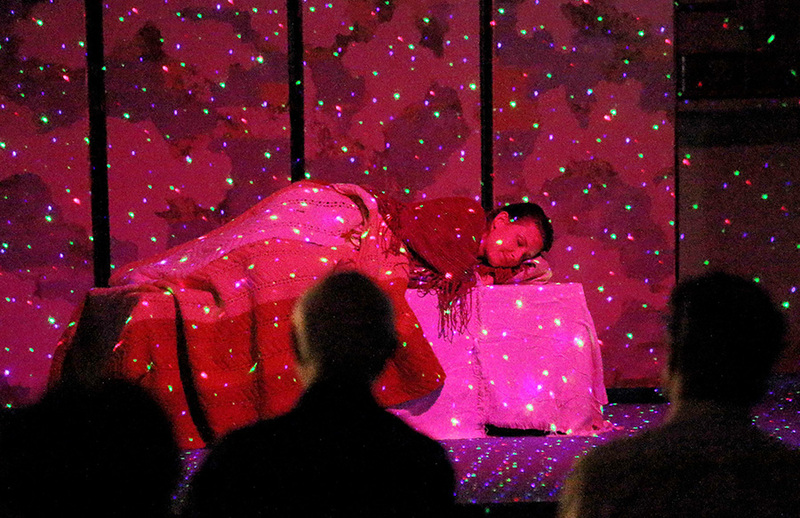 We had a production here last night of a beautiful play by Swami Kriyananda, The Land of Golden Sunshine. It was uplifting and delightful, and I’ve thought of some correlations between the play and the Adam and Eve story. They may prove disastrous for my talk, or maybe they’ll be moderately interesting, but let’s get started and see where they take us. Paramhansa Yogananda interpreted the Adam and Eve story as a spiritual allegory. Over the centuries, many people have been baffled by the part where Adam and Eve eat of the fruit of the tree of life, and as a result they’re granted the knowledge of good and evil. It’s been traditionally interpreted as having entirely to do with sexuality, and that’s one of the reasons Adam and Eve isn’t our favorite topic. But even if we ignore that aspect, it can be complicated to explain its spiritual meaning. Swami Kriyananda explained that “the fruit of the tree of knowledge of good and evil” symbolizes the dual nature of creation. Adam and Eve represent not only the original human beings, but our own original nature, which is eternally and inseparably one with Spirit. And when they “eat of the fruit,” it means that their attention is drawn outward to the satisfactions of this world. Finally, “the knowledge of good and evil” is the Bible’s way of telling us that they have fallen from the primal purity of their original oneness with Spirit. Swamiji pointed out that everything in this physical universe has its dual opposite. And because we’ve lost touch with our original oneness, we find ourselves struggling to reconcile the dualities of our own nature, and longing for the paradise we left behind. When Adam and Eve began to look outward for their fulfillment, they found, as we’ve all found, that we can, indeed, find a certain outward satisfaction, but that it doesn’t last, and it can never satisfy our longing for our long-lost oneness with God. We’re continually seeking that satisfaction. And it’s poignant to see how, even as little babies, we’re looking for it. When little Leiah Mahoney was born and just two minutes old, I watched her reach up and grab her father’s hand. Her little hand was so tiny, and she grabbed her daddy’s thumb, and of course she grabbed his heart and held it forever. It was astonishing to see how quickly she turned outward, and the strength with which she gripped Chaitanya’s hand. You could see the cycle starting all over again, of feeling ourselves as separate beings, and searching for our original oneness. In just about everything we do, we’re looking to satisfy that longing for the missing part of ourselves. And where we’re most powerfully drawn to seek it is in the duality of male and female. The longing that seeks its satisfaction through that compelling physical desire is based on a much more fundamental feeling that there’s a side of ourselves that we’ve lost touch with, and that we long to merge with and become one with again. Swamiji speaks of how each of us is a kingdom unto ourselves, with many citizens, all of them with different attitudes. Each of our inner citizens has its own complete personality, and all of the citizens are tied together by the ego. We have, he said, citizens that are working for the good of all, and that represent our loving impulses: our impulse to be kind and compassionate, and to meditate. In that part of ourselves, we have the welfare of the whole world at heart, and sometimes we find ourselves rushing toward it with great joy. But there are other citizens as well – impulses of anger and greed, jealousy, loneliness, envy, and all of the meannesses of the heart, as Sri Yukteswar called them, that keep us separate from the “natural love of the heart” that can draw us back to God. The negative citizens are working for their own self-interest, and they aren’t interested at all in what’s good for others. The ego is an actor, playing the parts of these inner citizens, and he’s trying to get them to give him the satisfaction he craves. The inner citizens of our desires are wandering in a thousand different directions, and the ego thinks that if it can just corral them and direct them, it will find what it’s seeking. Swamiji said that the citizens who have the welfare of all at heart are able to deal with the other kingdoms, meaning other people, because they know that kindly relations are necessary. But the selfish ones are busy trying to sabotage those efforts. Now, we all have feelings, both positive and benign and negative and depressed. When we feel uplifted, we’re moving toward Spirit, and our sense of separation is eased. When we’re riding the currents of hope and optimism, we recognize that the duality that prevents us from knowing our true reality is not outside us, but that it is part of us. The fracturing of our inner nature is ongoing. It’s a battle that’s we’re fighting constantly. For a time we feel united and whole, and then we fracture and feel divided against ourselves again, and alienated from our core of bliss. Those of us who participated in Land of Golden Sunshine felt a wonderful sense of healing from that inner fracturing. After months of preparing the play, we were reasonably confident that the first performance would go well and be a success. By the end of the performance, we knew that it was all we’d hoped it would be, and there was a wonderful, integrated feeling of joy that spread silently throughout the cast. And it wasn’t merely because our own little kingdoms had been healed and had come together, but because there was a powerful sense that we were sharing the same experience. On the second night, our director, Marcel, urged us to dive back into that feeling of calm unity, and express it as we performed. Now, I’ll tie the experience of the play to the Adam and Eve story, and I’ll add some things I’ve learned in recent months about art and creativity. The path of Self-realization that Paramhansa Yogananda and Swami Kriyananda gave us is not arbitrary. It’s part of a long tradition, and a body of universal, timeless teachings that will never change. But there are features of this path that other avatars haven’t touched upon. And that’s because we are standing at the dawn of a new age which is called Dwapara Yuga, when mankind will become increasingly aware that the underlying reality of cosmic creation is energy. And this is why a defining feature of Yogananda’s teachings is that he expressed them more flowingly and energetically as a creative artist, in contrast to the previous age of materialistic awareness, called Kali Yuga, when the teachings were expressed as a system of rules and dogmas that were set in stone. Yogananda was not at all the world-withdrawn type of yogi who lives in perpetual silence in a Himalayan cave. He embraced life, and he took great pains to make his work beautiful. I’m thinking of the design of the beautiful Lake Shrine in Pacific Palisades – it’s completely original, and it was built according to his design. He expressed his teachings in terms of poetry and music – he wrote a volume of inspired poems, Whispers From Eternity, that, he said, would answer our every spiritual question. He designed the beautiful gates of the colony at Encinitas, and the subtle oriental design of our altars, which he sketched, and which Swami Kriyananda drew from memory of Master’s design. Master not only lived in God; he used his creativity to express the divine outwardly. And Swamiji’s creativity, in turn, was breathtaking. Among the saints, there has been nothing like his creative output: the 150 books he wrote and the 400 pieces of music, the thousands of photographs, and the designs for buildings. His greatest creative art, of course, was his ability to inspire us to use our own energy and creativity to express ourselves creatively and serve God. When I first read Swamiji’s book, Art as a Hidden Message, I had the uncanny feeling that we must become artists before we can be freed. It was more than a little baffling to me at the time. But then I had the opportunity to spend time with Dana Lynne Andersen who’s a disciple of Master and a wonderful painter. 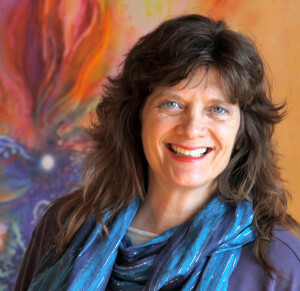 Dana designed the covers for a number of Swami’s books, and she has made a deep study of creativity. I participated in a workshop on creativity that she gave. At the start, she said something that affected me powerfully. She said that we all have many internal citizens – we have qualities of envy fighting against self-acceptance, we have jealousy fighting against self-worth, and we have altruism fighting against selfishness. And all of these forces are in constant motion, writhing inside us. Dana pointed out that in healthy societies, people use art as a way to work out these inner tendencies. In traditional cultures, the men will gather around the fire and sing and dance together, and the women will have their own dances, and they’ll quilt and sing while the men are hunting and singing. They’re always doing something creative. They’re carving icons and painting their houses. And what’s happening on a deep level is that they are translating whatever they’re feeling into their particular vision of beauty. You might have war dances, where you’re taking your aggressive energy and making it powerful so that you can work through those feelings and give it an artistic form that will pass through you and perhaps help you align those feelings in a constructive way. Dana pointed out that in our culture we have two ways of dealing with our feelings: we either suppress them, or we project them onto others. Because we’ve had our spontaneous creativity taken away from us. As she put it, you give a child a piece of paper and a crayon, and he doesn’t need any instructions. Somebody in the workshop joked, “Yes, he’ll eat the crayon and flush the paper down the toilet.” But that’s not true, because children will start squiggling with the crayon on the paper, or they’ll draw a fish or a tree or their family or their house. You put on music and the kids will be dancing and humming and singing. You don’t have to tell a child to dance, because the child knows what to do. He hears the music and feels it and lets it come through. Dana talked about what we need to do to get back our creativity. The seminar wasn’t intended for accomplished artists, to help them become better. It was to help inhibited people become four years old again. It was about finding the part of ourselves where we can use crayons and paint to express what is in us so that we can work on it and integrate it and create something harmonious and beautiful. It was very interesting to me, because I have many forms of creativity in my life, but paint and crayons aren’t one of them. I had never, until that point, tried to draw. When I was a child, somebody told me, very early on, that I couldn’t draw, and I’ve never picked up a crayon and tried to think about a feeling or a reality that is important to me, and try to use crayons to say it. So even though I can’t draw, that’s exactly what I did. I held the crayons and paints and chalk sticks in my hands, and I thought of the many things that have happened in my life, both uplifting and challenging, and I tried to use the crayon to let it flow through me. Later, Dana paired us off and sent us outdoors and made us dance our painting. And, you know, your first thought is I would rather die – I’ll just take a bullet instead. But you would kind of pull yourself together. And then you had to dance your partner’s painting. So you weren’t just going through what was familiar to you, but you were figuring out how you could take a squiggly line that ends in a circle and let it run through your body. And I can only say that it was amazing. An interesting thing happened to me last night, in the midst of our play. 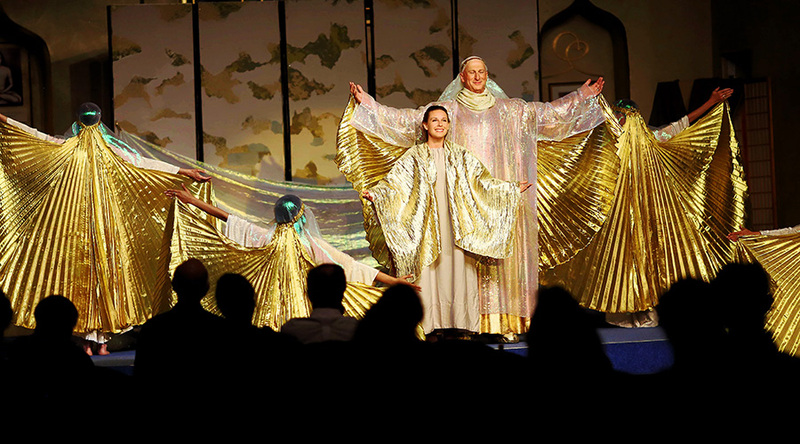 We had four beautiful angels dancing on the stage, dressed in fantastic gold-winged costumes. I was the narrator, standing off to the side of the stage, but the placement wasn’t exactly right, and one of the dancers came very close to me. She rushed at me at great speed, and in the last moment she twirled with a flourish, and it was magnificent. Sneha is a very good dancer, and you could feel the tremendous rush of energy that was moving through her. I’m sure that everyone in the audience felt it and were moved, because this is who we are. We are these powerful feelings, and particularly we are, most truly, the uplifted feelings that were expressed by the play. Swamiji said that intuition, which Yogananda defined as the soul’s power of knowing God, is “calm inner feeling.” And I’m sure that many of the people in the audience felt the Divine trying to express itself through us. In the ordinary circumstances of our lives, those feelings are constantly at war. And what we need to do is find ways to bring them into perfect resolution and harmony. The same four dancers who ended up dressed in gold at the end of the play started the performance by dancing a violent storm. The dance was unaccompanied by any kind of music, but only by the sound of the howling wind. Before the play, most of the dancing we had witnessed here in our temple had been relatively meek and mild – dancing to Paramhansa Yogananda’s chant, “Door of My Heart,” for example. I’m joking, because our dances are much more beautiful and powerful than I’m suggesting. But I’m sure it was a big shock to the audience, at the start of Land of Golden Sunshine, to have their senses violently assaulted by extremely loud thunder, and lightning flashes, and dark, wraithlike dancing creatures rushing from the back of the hall and swooping and swerving onto the darkened stage while the narrator bellowed out Swami’s words which were all about pillaging, shouting, ripping, and tearing. It was a terrifying experience, because we all have those feelings – those citizens in us – and we’ve learned to fear them, so that we want to keep them hidden, or we might try to civilize them, but they are there nonetheless. Even more, they are part of God’s creation. And anything that we’re afraid of is going to control us, whether we’re ready to admit those feelings or not. It was so hard for them to let that much energy flow through them, because in our society we have only two ways of dealing with powerful feelings: we either suppress them or we project them. We don’t just step into them and let them be whatever they are. We suppress our feelings, or we project them, and the problem is, you can never get over your dark feelings by projecting them – you cannot simply scream at the people you dislike, and hope it will rid you of those feelings. 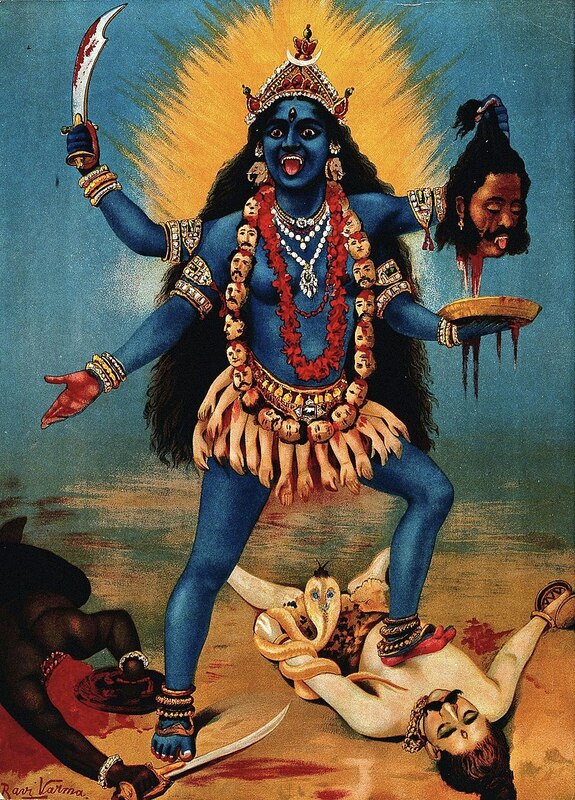 But that’s a very different level of feeling from what Kali is personifying with her skulls. In one hand she’s holding a sword, and she’s extending her other hand in blessing. And the reason for her fierce appearance is that she represents the Divine Mother’s ability to bless us with the power to overcome our obstacles quickly, with tremendous, indomitable will. I began to understand Kali when we were in Calcutta during the time of the Kali Puja, a festival where each neighborhood builds a huge statue of Kali. We were mingling with the huge crowd, and I found myself being pressed backward until I was right next to the tremendous statue of Kali. And I don’t know what impelled me, but I turned and found her leering over me. I looked at her and said, “Who are you? What are you doing here?” And the answer that came very clearly was that there had to have been a human being who had had the vision of Kali, and they had painted her that way. They had a vision of the reality of all of these citizens that are dwelling in us, and they saw how God was chopping off our heads and blessing us at the same time. So the person who had the vision put it in a creative form that you can look at, and it will communicate to you on a subtle level. And it begins to tell you who you are and what you’re supposed to do, and how you can get these dualities to reconcile, through the fierce creative power of Her grace. Now, we cannot find our freedom quickly, but Paramhansa Yogananda gave us a shortcut that makes it much easier. There’s no way the little tree will be able to skip any of the destined stages of its growth. And we, with our mental citizens, are hoping that some of them will just lose their way. But they won’t, because they are intimately entwined with our nature, and we need to figure out how to bring them into a harmonious alignment. Master and Swamiji strongly encouraged and urged us to pursue our artistic interests, as channels for understanding who we are and what we’re feeling, and to uplift our consciousness. In the 1980s, when Swamiji was married to Rosanna Golia for six or seven years, he said, “I am accustomed to following my heart.” And he added, “No matter how it may look.” He remarked that it was a little harder for Rosanna to get used to that way of living. She overcame the obstacles in time, but for him, it was his natural way of being. “I am accustomed to following my heart.” What a depth of meaning there is in those words! You might never have thought of Swamiji in those terms, because he had such a strong will and such a brilliant mind. And when you hear someone say that they follow their heart, you might think of someone who’s sort of poetic and airy-fairy, dancing through a flowery meadow with a garland in their hair. But Swami was able to say it with power and perfect sincerity, because he had worked for many lifetimes to bring the inner duality into one. And the heart was, for him, a place of unity. The heart is where our feelings reside, and where they do battle. And the heart is finally where we’re able to resolve those feelings and bring them into wholeness. On another occasion, Swamiji said, “We think that meditation is about calming the mind.” He said, “But it’s about calming the heart.” Because the heart is where our inner citizens are fighting, and it’s those agitated feelings in the heart that cause the mind to be restless. And this is where the idea of finding wholesome creative outlets for our feelings has tremendous spiritual value for us, because it can help us bring the heart into calmness and wholeness. And when the heart is at peace, our inner citizens are at peace. Why did Master give us the chants? And why did he change the style of chanting? He didn’t bring the traditional Indian style of chanting, where they’re repeating the names of various gods. He gave us poetry and deep meaning, and ideas that not only have the power of sound behind them but a great power of affirmation. And the same is true for Swamiji’s songs. I’m not a good singer, so I can’t simply belt out a song for you. I can only share the words as poetry. The bond not even time can untie. And made her His own. For endless stretches of time, we’ve found ourselves pulled together then pulled apart, over and over. And “In love she at last learned – why.” It all resolves beautifully in the end, and that is our journey and our goal, to be reunited with our Maker and to know His perfect love.